When I travel, eating food local to the region or at some of the area’s best restaurants, is one of my favourite (and most delicious) ways to explore. You can always find good food—anywhere you go, but there are some places a food lover just feels right at home, like for instance, in pizza and pasta’s motherland! 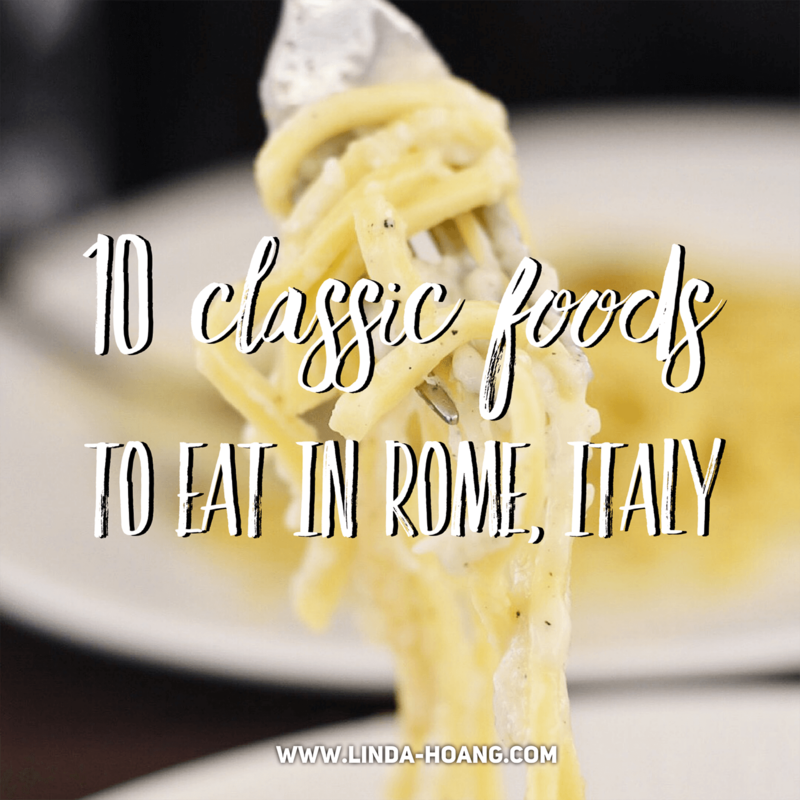 If you’re travelling to Italy, specifically, to Rome, then there are certain foods you’ve got to eat! They won’t be hard to come by either, because they’re part of the food fabric of the region (a.k.a. you’ll find a lot of these on almost any restaurant menu). 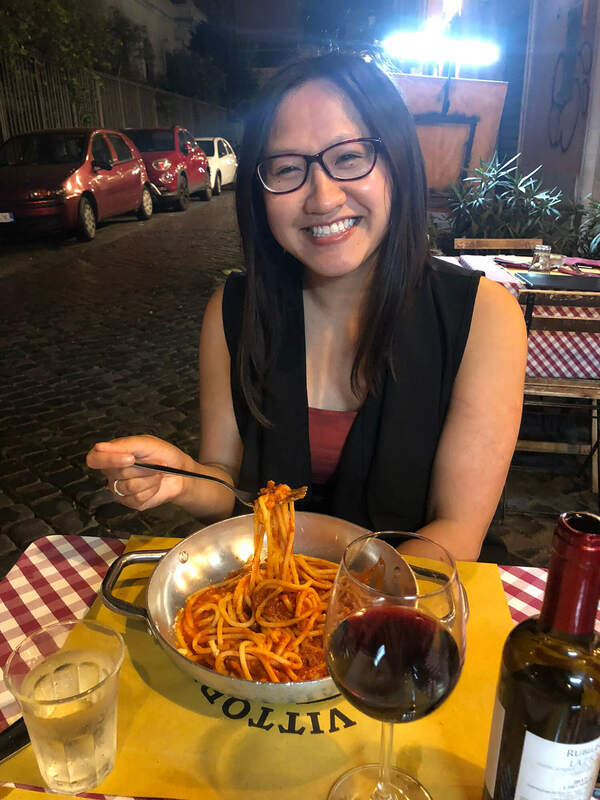 During my visit to Rome, I made it my mission to try a bunch of very “Roman” foods. 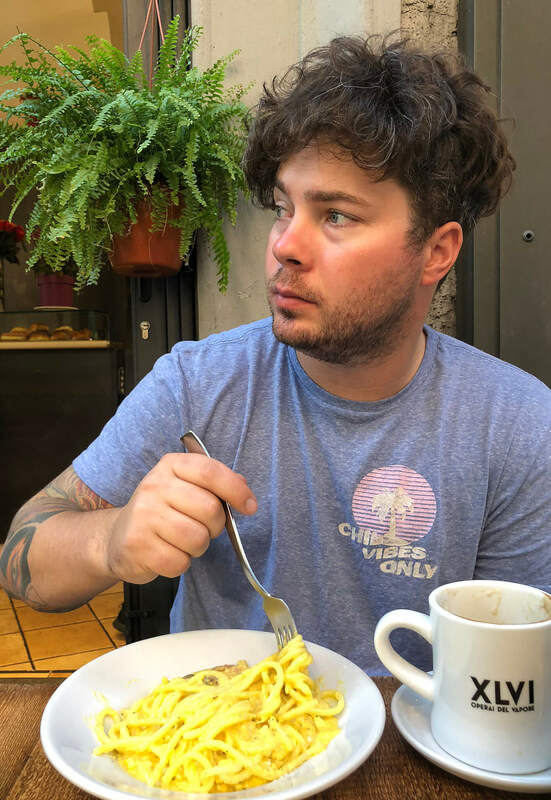 There are lots of great local food tours you can book, and even make-homemade-pasta classes, which all sounded great, but Mike and I opted to do our own little food crawls each day, and it made for some pretty fun adventures and fairly full bellies. Below are 10 Roman classics you’ve got to try when visiting Rome, Italy. 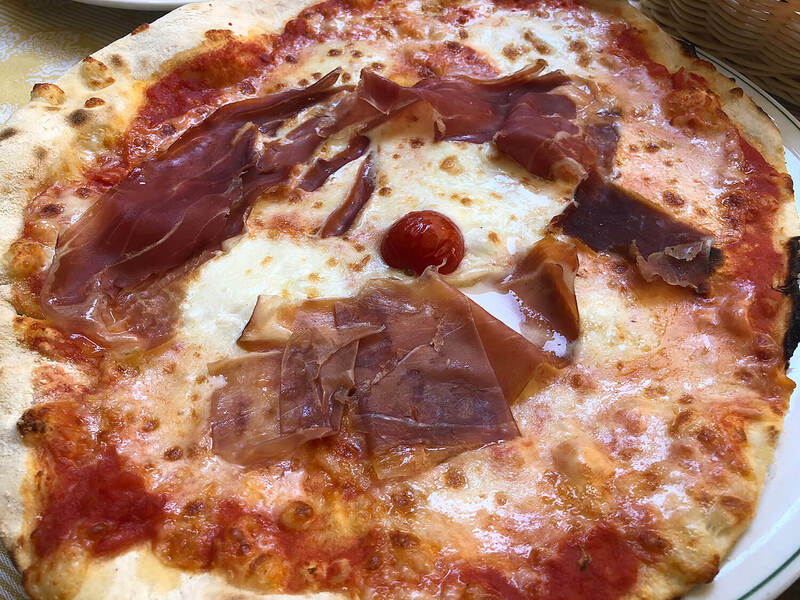 A very thin, Roman prosciutto pizza! Mike and I didn’t realize until we got to Rome, that Roman pizza is thin crust—my favourite! No thick outer edges or deep dishes here (well, that’s not true. I’m sure you can find it, but it wouldn’t be considered your classic Roman pizza!) Pizza popular to the region Lazio (of which Rome is the capital), is thin and super crispy, and typically comes with maybe one or two toppings (we found a lot of “less is more” when it came to food toppings in Rome). In some Rome neighbourhoods like at Doppiozeroo restaurant in Ostiense, we also got to try Roman Pizza al Taglio—long, rectangle pizzas sold by the square slice, where you’re charged by the weight of that slice. This type of pizza is also quite Roman! Look for it when you visit. 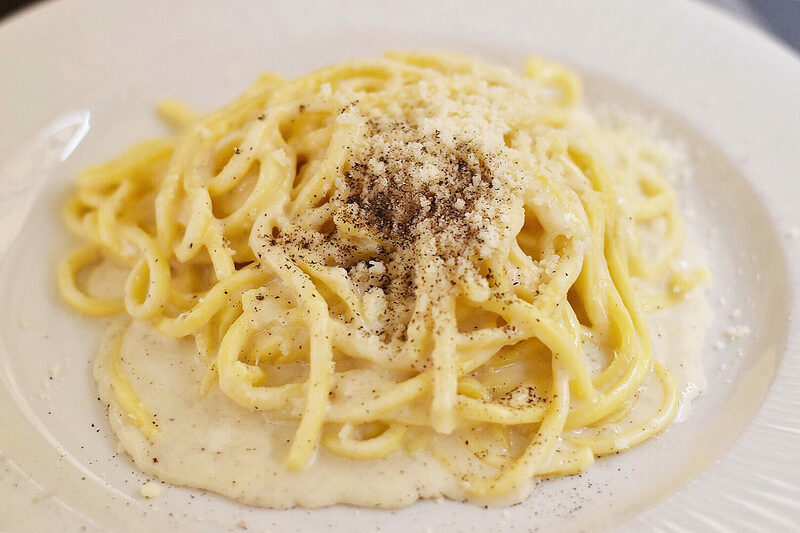 Rich, Cacio e Pepe is a must-try during your visit to Rome. Cacio e pepe is a classic, super ancient Roman dish comprised of just three ingredients: pasta, pecorino cheese, and black pepper (the translation is “cheese and pepper”). It is said that the dish originated with Roman shepherds, and when they left the countryside, they carried with them ingredients to make cacio e pepe. Cacio e pepe is super rich and creamy, but not from milk, cream, butter, or oil—it’s from mixing cheese and pepper with pasta water. This cheese and pepper preparation is becoming increasingly popular in North America, and goes beyond pasta too—for instance, I’ve also had the pleasure of eating cacio e pepe popcorn and cacio e pepe chips. D-e-l-i-c-i-o-u-s! We had cacio e pepe in a few spots in Rome (it’s literally everywhere) but I really enjoyed the one from Ai Cocci. A pollo (chicken) Trapizzino pizza/sandwich street food in Rome! 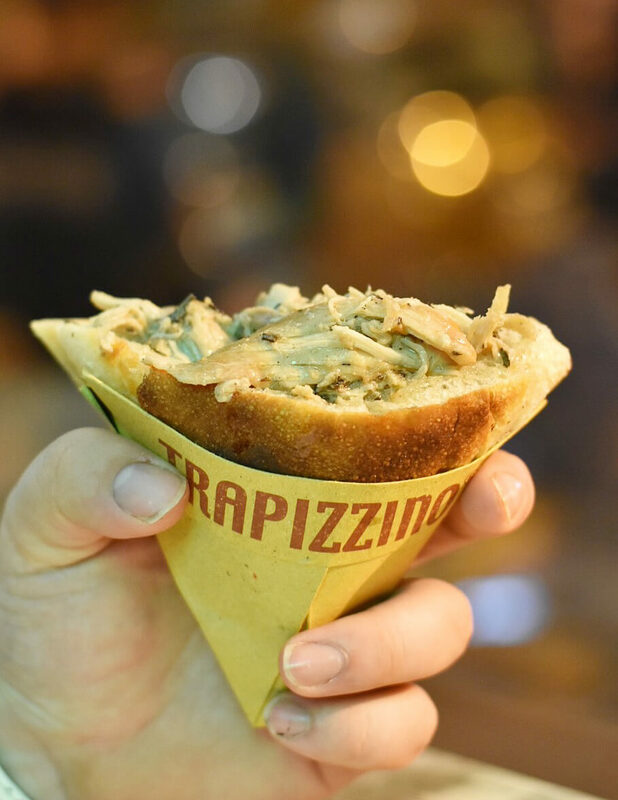 When you visit Rome, you’ll find it has some signature street food, like the ‘Trapizzino’—a mix between a sandwich and a pizza, this triangular cone comes stuffed with some kind of meat or vegetable. These Trapizzinos are pretty cheap (you should be able to get them for under 5 euro) and are a popular Roman snack. They are hot, filling, and depending on your stuffing selection, can be really delicious. You can get pretty standard filling like meatballs or chicken, but then there are some places that have more exotic fillings. Often served (or suggested that you eat it with) wine or beer! That’s how we had it at BeRe, a brew pub near the Vatican. We tried it at the end of our first night in Rome and Mike said it was the best thing he’d had all day! Our very first pasta in Rome—Spaghetti alla Carbonara! Another popular pasta which originated in Rome is carbonara! Like its sister cacio e pepe, this Roman classic which typically comes with a spaghetti noodle but can be made with other types of noodles, doesn’t require a whole lot of ingredients—pasta, eggs, pecoroni cheese, and pancetta (cured pork belly) or guanciale (cured pork cheek/jowl). American recipes often call for heavy cream, but to a Roman, that’s crazy. You shouldn’t need it. How the egg is stirred into the pasta is how the dish gets its creamy consistency. Apparently carbonara’s origins are pretty debated. It’s not as ancient as cacio e pepe. It could possibly have been introduced to the region in the late 40s/50s, possibly after or as a result of World War II. Or they say it could have originated with coal miners. Regardless of how it came to be, it is a must-eat when you visit Rome. In fact, for us, it was the very first dish we had when we got off the plane. Perfect! A refreshing mango and strawberry gelato near the Colosseum in Rome! Gelato (Italian ice cream) is one of my favourite desserts and in Rome (well, anywhere in Italy), you can find gelato shops on almost any corner! 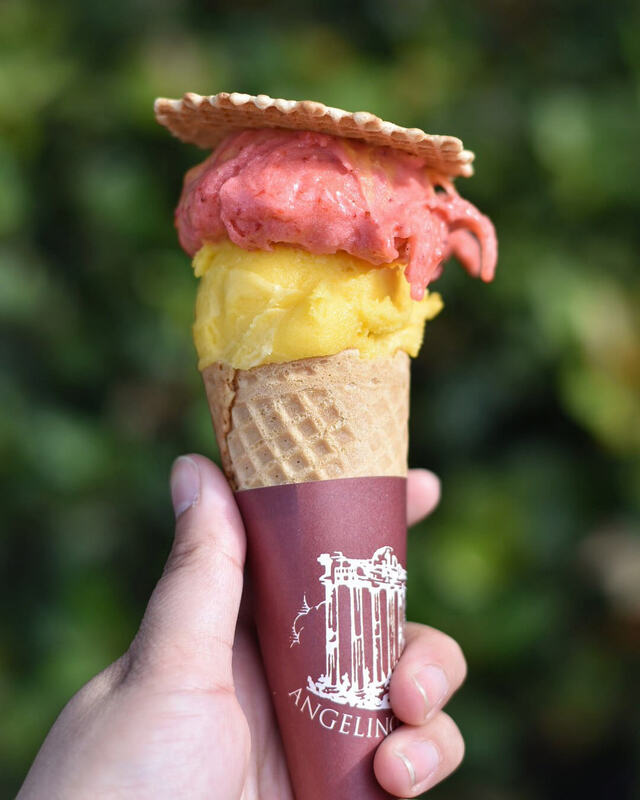 Fruity, light (gelato isn’t as fat as ice cream and made with more milk than cream), refreshing, delicious, and affordable, I could have gelato multiple times a day—in fact, some days in Rome, I did! A cup or cone of gelato is pretty darn affordable in Italy in general, most of mine were in the 2 to 2.50 euro range. You might find they get a bit pricier closer to tourist spots. In the lovely Travestere neighbourhood of Rome, I got a gelato cup for just 1 euro at a place called Otaleg. Italy’s favourite appetizer—bruschetta, grilled Italian bread topped with olive oil, garlic and tomatoes. Whether you pronounce it brus-ketta or bru-shetta, bruschetta is Italy’s favourite appetizer (right?) 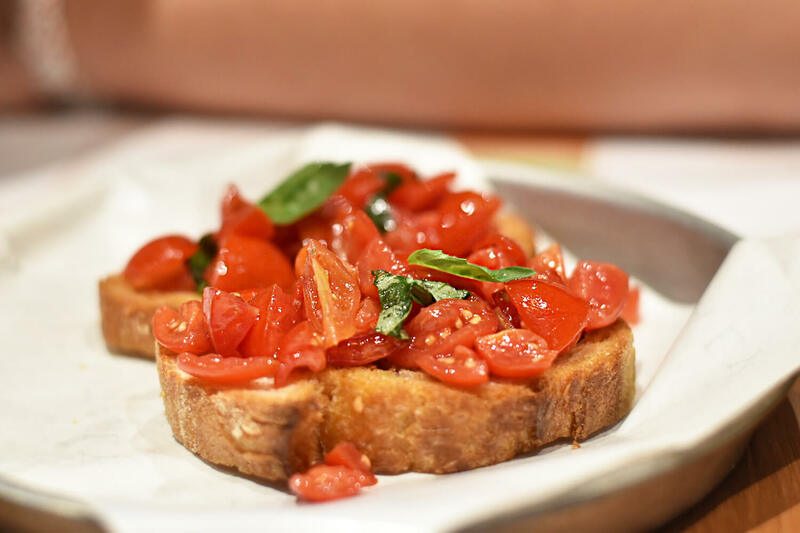 It apparently has its origins in Central Italy (including the Lazio region featuring Rome), though really, bruschetta is a popular dish all over the country, and depending on where you go, you’ll find different types of toppings. Bruschetta is a crusty Italian bread topped with garlic, olive oil and some type of topping—typically tomatoes. We found the Romans to be quite generous with their tomato bruschetta topping. Bruschetta is really refreshing—the tomatoes demand it. The original bruschettas were said to have been cooked over coal. Today, they’re often grilled. Bonus tomato-based dish: Although I don’t think it originated in the Rome region, I did notice a lot of people in whatever restaurant we went to, were ordering tomato salads with a giant ball of Buffalo Mozzarella. I also had one while we were in Rome, but I figured since I couldn’t find it to have specific ties to Rome, I didn’t formally include it on this list. An espresso in the afternoon (a cappuccino in the morning!) Learning Italian coffee rules. Did you know the very first coffee house reportedly opened in Italy back in the 1600s? The espresso machine was also invented in the 1800s in this country. Suffice to say, coffee culture is pretty big in Italy. In Rome (well,all of Italy), there’s some rules about when you’re supposed to drink certain coffees. The biggest rule (or one we noticed the most while we were there), is that you should only have a cappuccino in the morning. Coffee with milk after 11 a.m. is a no-no. 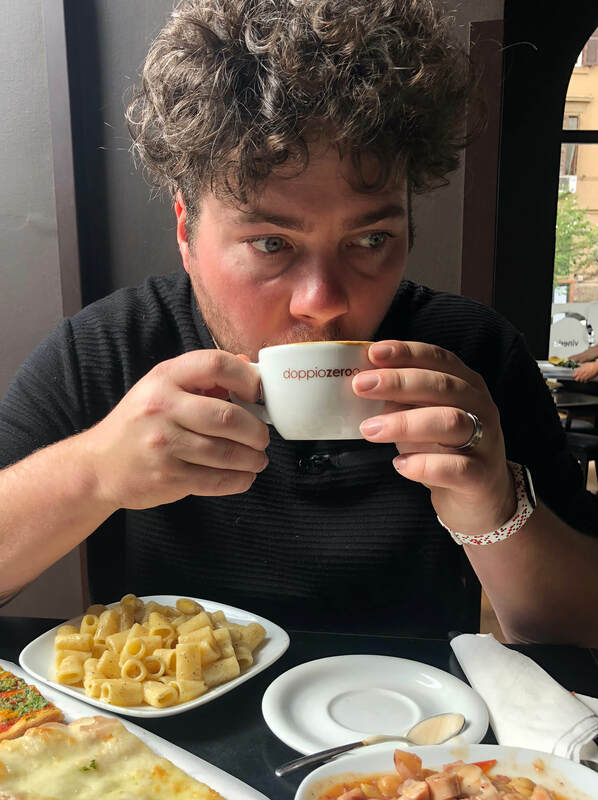 Mike tried to order a cappuccino after this time and they were basically like, espresso? lol. Apparently this is because Italians think the milk that’s in cappuccinos aren’t the best for digestion later in the day. 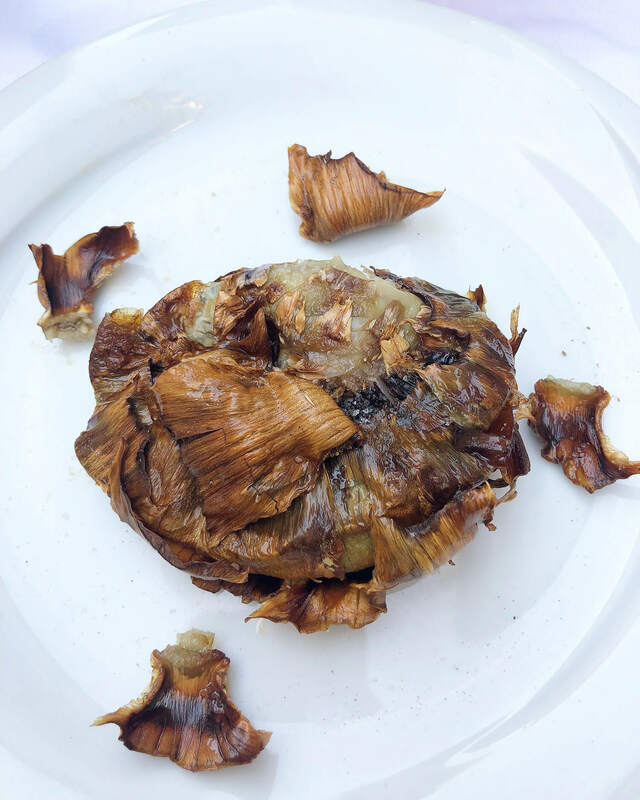 A very popular Roman-Jewish dish: Fried Artichokes (Carciofi Alla Giudia). Carciofi Alla Giudia is the most popular preparation of artichokes in Rome. It originated in the Roman Jewish Grotto and is basically deep fried artichokes. Some restaurants will only serve it when artichokes are in season, but there are a few spots you can get it year-round, like Nonna Betta, which was featured in an Anthony Bourdain Parts Unknown episode before. Though to be honest, I didn’t love this preparation of artichoke—even though I love artichokes! Still, definitely worth trying if you’re on a mission to eat Roman foods, plus the Jewish Grotto is a cool neighbourhood to visit. A plate of Fritti at Ai Cocci in Rome, including arancini and supplì. You know when you see Fritti on the menu at Italian restaurants? That’s a beautiful section featuring fried foods. Italians have invented some pretty tasty fried items, like Arancini – deep fried, rice-stuffed balls filled with a mix of savoury flavours. Arancini is a popular Italian fritti, and something I see a lot of at Italian restaurants. 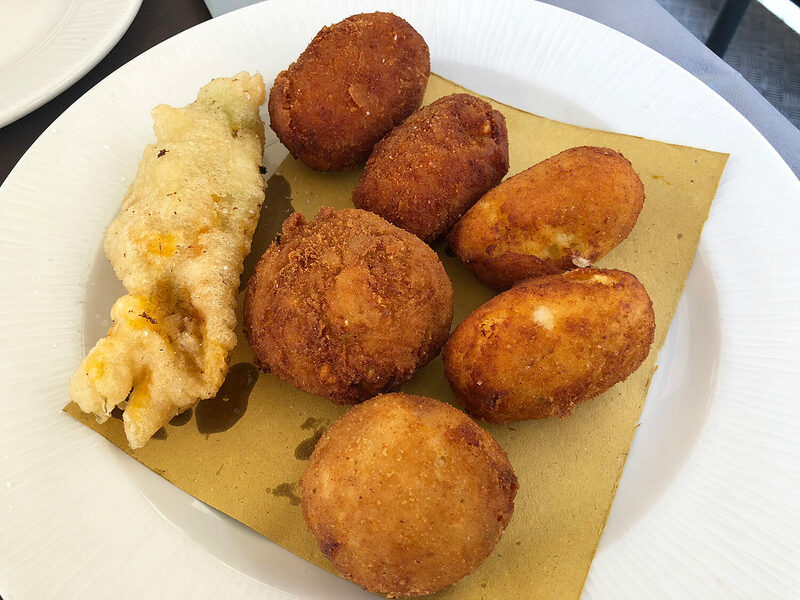 But something I didn’t know until I went to Rome is that Arancini is considered traditional to Sicily, whereas Rome’s preferred deep fried rice ball dish is called Supplì. What’s the difference? I mean they’re really similar. They share the deep fried rice attributes, and general shape, but Supplì is typically more oblong (long ball lol) in shape, and filled with tomato sauce and mozzarella cheese (the mozza is a must), whereas Arancini is more true to the ball (circular) shape, and can be filled with variety of different meat or vegetables. Something fun I also learned about Supplì is that the word is an Italian take on the French word for ‘surprise’ and that’s because when they were first invented, it was a surprise for people to discover there was a piece of mozzarella in the middle of it! Bonus fritti featured in the above photo, that’s also a Roman classic: deep fried zucchini flowers with anchovies or Fiori di Zucca Fritti. I’m not a big fan of anchovies, but still really liked this dish. Bucatini all Amatriciana pasta, featuring tomato sauce, guanciale pork jowl, and hollow bucatini pasta, is a delicious, Roman classic! Mmm, all of the Roman classic pastas are basically my favourite, but I really enjoyed trying Bucatini all’Amatriciana I had at Da Vittorio. This dish is made of bucatini noodles, a noodle with a hole that runs through its centre (buco like hole). I love the texture of hollow bucatini, and this all’Amatriciana version comes with a tomato sauce, pecorino cheese, and guanciale meat—a cured pork jowl or cheek, like bacon or pancetta in terms of delicious fattiness. Variations of the dish will also include chili or red pepper flakes to turn up the heat. It’s named after the Italian town of Amatrice, which is also located in the Lazio region, a couple hours north east of rome. If you’re headed to Italy, make sure you look for these dishes on the menus! If you think I seriously missed something, let me know!! And just a heads up… in Italy, they charge you for water! So often, it’s cheaper to drink wine or beer in restaurants than getting a glass of water. I’ll be sharing more ‘practical’ tips to traveling to Italy in an upcoming blog post, so stay tuned! OMG just reading through your post and I got hungry. Thank god that I’m visiting Rome soon and I’ll be able to taste all those marvelous dishes.